Newark, NJ –- August 10, 2018 — Mayor Ras J. Baraka and Director of the Department of Health and Community Wellness, Dr. Mark J. Wade announced today that the City of Newark will launch the barrier-free 2018 School Bus Express (SBX) Program during the period of Monday, August 20 to Saturday, September 15, 2018. 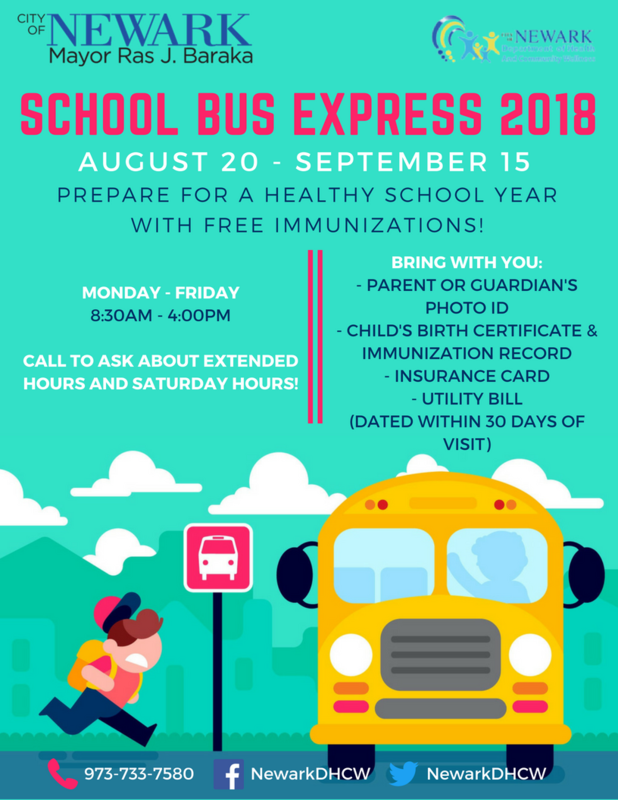 SBX is an annual program coordinated by the department to deliver required immunizations to children, on time, for school attendance in the Fall. The goal of the SBX vaccination program is to provide age appropriate and state required vaccines to children in a timely manner. SBX is also to ensure that Newark’s children receive their required immunizations before starting or returning to school. Immunization services will be offered at the Department of Health and Community Wellness, 110 William Street, Suite 108, in Newark’s Central Ward. Please note that due to the Labor Day holiday, the clinic will be closed on Monday, September 3. Immunization is a proven scientific approach that protects children from infectious diseases and their complications. All vaccines undergo long and careful review by scientists, doctors, and the federal government, to make sure they are safe. The New Jersey State Sanitary Code, Immunization of Pupils in Schools, requires the proof of immunization to attend a school, preschool, or child-care facilities. Monday through Friday, from 8:30 a.m. – 4:30 p.m.
Vaccination services are offered daily on a first-come basis at the Department of Health and Community Wellness, 110 William Street, Suite 108 in Newark’s Central Ward. Parents/guardians bringing their children for immunizations for the first time are required to have a copy of the child’s immunization record, child’s birth certificate, parent or guardian identification, and proof of residency such as a current utility, telephone, or cable bill, dated within the last 30 days of visit. In addition, if you have medical insurance, please bring the card/information. For more information, please contact Velda Font-Morris, MPH, Immunization Coordinator, Department of Health and Community Wellness, at (973) 733-7580.